During the 2009 and 2010 seasons, I ran a series of power ranking at Beyond the Box Score. They progressively became more and more complicated, but the initial premise was fairly straightforward. Rather than looking at actual wins, or even actual runs scored or runs allowed, I estimated runs scored and runs allowed from their components and used those scores to estimate winning percentage. The result was a ranking of teams based on the same component statistics that we use to evaluate individual players. At the urging of no one, I've reconstituted the power rankings for this season. * Details on calculations are below, but I don't want to bury the lede: here are the official OB&tR Power Rankings for 18 May, 2015! * Or maybe, for this post only! We'll see! It's not lost on me that the Reds are on this list. I had no idea they would do well on this until after I finished the spreadsheet, honest! Why have these teams rated highly? Well...it's not any one reason. Some of these teams were predicted to score a lot more runs than they actually have (Tigers +23 runs, Giants +30 runs). Some were predicted to have allowed far fewer runs than they actually have (Indians -28 runs(! ), Athletics -23 runs). Someare outstanding fielding teams (Reds & Tigers at +12 and +14), while some are very poor fielding teams (Indians -15 runs, Athletics -13 runs). There appears to be a bit of a weird arc in the data, but if there were one data point at around (0,-0.05), we wouldn't be saying that. I'm just not convinced that fielding causes any kind of systematic bias in the data. And look: the Royals (at +33 runs!) are right at their Pythagorean expectation. So, maybe these teams have just gotten unlucky. Or something. I certainly would expect that the difference between TPI and Pythagorean record will close as the season goes on. Which is more predictive is an open question. All of these teams are average-fielding teams. Some have hit better than estimated (Twins +20, Mets +16). Some have pitched or fielded better than estimated (Mets -30, Pirates -27). So, again, no clear pattern. ...In any case, there you have it. I find this kind of thing interesting to track, so I'll likely update it from time to time throughout the season. Calculation details below the jump! Team Runs Scored are estimated using wRC from FanGraphs, after a park adjustment. I s'pose a base runs-based estimate would be better, but it won't matter by more than a run or two most of the time. Pitching Runs Allowed are based on BPro's new DRA statistic. This is a historical statistic estimating runs scored after adjustments for a variety of confounding factors (ballpark, catcher, fielders, opponent quality, temperature, etc). I might eventually add FIP into the calculation and do some kind of average, but for now we'll just roll with DRA. 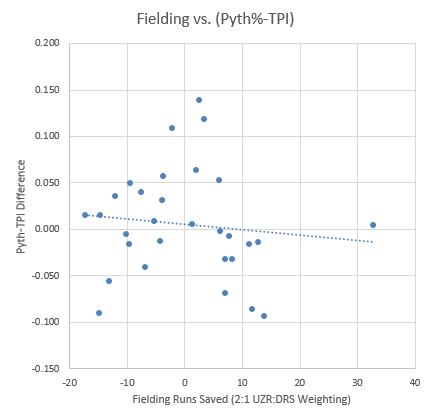 Fielding Runs are calculated from a 2:1 weighted average of UZR & DRS. I do the 2:1 thing because I like UZR better, but don't want to completely ignore DRS. I'd like to add catcher fielding into this, but right now BPro doesn't report teams on their catching reports. I'm too lazy to assign them myself. Estimated runs scored & runs allowed are then fed into PythagoPat and, presto! We get what I'm calling "Team Performance Index." It's basically the same thing as BPro's 2nd-order winning percentage, with somewhat different components. The spreadsheet is set up to pull the data automatically. Thanks to the data sources for allowing fair use of the information they broadcast to the interwebs.